This packages can be used to generate call graphs of PHP code with GraphViz. There is one class that can generate diagrams in the GraphViz DOT format from a list of called or uncalled functions. 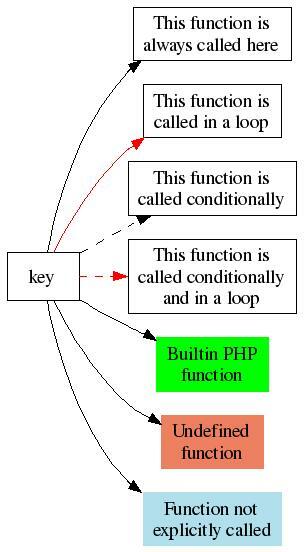 Additional functions can parse given PHP scripts to extract the list of functions in the code to generate the call tree graph. Prize: One downloadable e-book of choice by Manning Sometimes it is useful to see which code is being used or not used in your applications. One way to see that information is to generate visual code call graphs. This package implements a solution to generate call graphs from PHP code in GraphViz format. The generated GraphViz files can be viewed or rendered in many graphical formats. This is the second release version which has a much cleaner API. directory called 'graphs' in the same dir. come with this readme.txt file and 3 example scripts. nodes rendered in the image - maaking them clickable. It is configured to geerate links to PHPXREF documentation. the only change necessary is to specify the location of the graphViz dot interpreter. the output file(s). You should plan to make some provision for these in your own code.